Our 25ft x 18ft studio is located at our warehouse near Olde Towne Arvada. It features white floors, two white walls, and an updated accent wall. There is also a large south-facing window with tons of natural light and a suspended greenery wall. 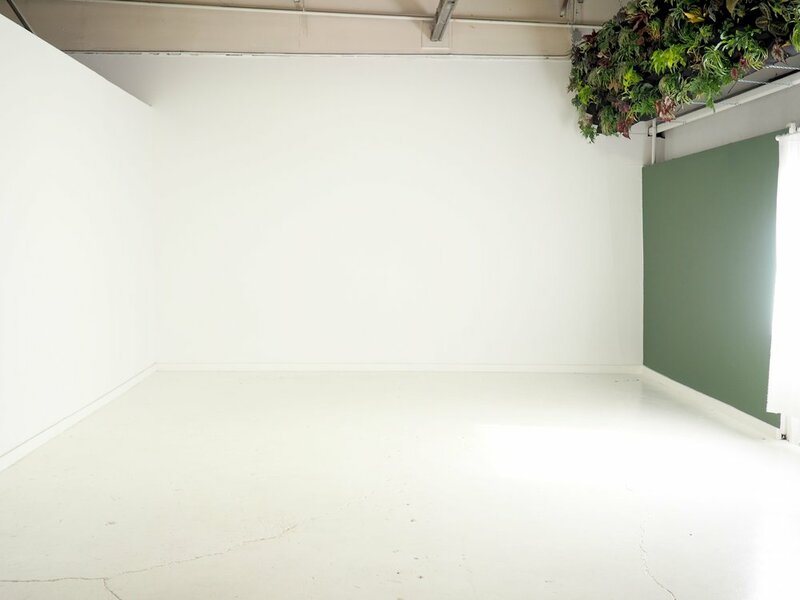 Rent one of our packages for your workshop or event, or book the empty studio and we'll help you fulfill your vision with our ala carte options. Rent our 25ft x 18ft studio alone or add items as you see fit using our a la carte service. An awesome starting place for a custom space. Is also great for a photo space, yoga class, or bare bones networking event. 2 hr minimum. Tall rolling demo table up front with plenty of space to either side for product or props. Room to walk through aisle and between tables to interact with participants. Great for hands-on workshops. Seats 24 maximum dependent on how much space is needed per person at table. Pricing available per person. Retro-style chalkboard at front of room with two tall Eames cocktail stools for instructors. Alternatively, chalkboard can be removed and visuals can be projected onto white wall (projector not included). Seats 24 maximum, not including instructors. Pricing available per person. Small lounge including one sofa, one rug, and a coffee table. This is a great set up for an interview or Q&A session where participants may want to take notes. Seats 24 maximum, not including speaker. Pricing available per person. Wood slat chairs used for guest seating, facing a small lounge occupied by the speaker or discussion leader. Our largest seated group option. White wall could also be used to project images for viewing party. Seats 50 maximum, not including speaker. Pricing available per person. This standing room only option gives the studio a relaxed cocktail hour feel while allowing more people to fit into the space. Would be great to use in conjunction with food or beverage bars (not included). Great for mingling and facilitating open discussion with option for a speaker at the head of the room. This option allows for one to two people per table - depending on surface needed for activity. Fits 9 cocktail tables comfortably with demo up front. 18 participants maximum. Pricing available per person. Two long rows of tables with chairs on either side and a wide aisle and our tall rolling demo table up front. Could work for short simple instruction with activity at table. This set up would also be great for a catering test or family style meal. Seat 32 maximum. Pricing available per person.